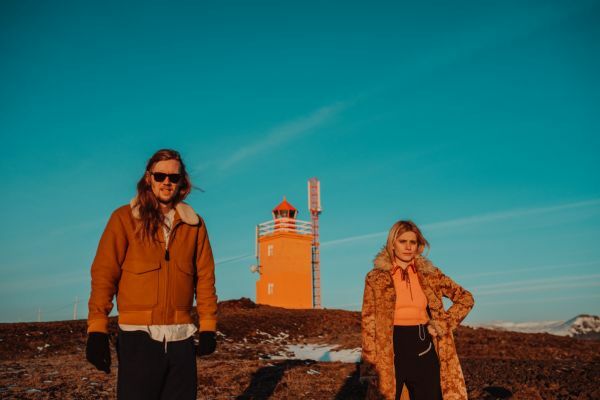 Pale Moon — The phrase sounds like a moon condition we have yet to discover, but is in fact a rising musical duo from Reykjavik made up of Icelander Árni Guðjónsson and Siberia-Russian*Natasha Sushchenko*. This psychedelic act carve their path in music with haunting, captivating melodies and lush neo-psych textures that sound as if they emanate the ’70s scene. The collaboration began in the Catalan city of Barcelona where they first met. It wasn’t until a trip to Mexico that the power duo crafted their first demos and decided it was time to pull up the sleeves and record these massive jams. Inspired by the Rolling Stone album Exile on Main St., they set up a recording studio in an old farmhouse in the South of Iceland. Árni’s parents, who used to breed sheep and prize winning stallions there, had moved the operation to another land and lucky for Pale Moon, it was still vacant. It seemed like the only way to escape everyday hustle and bustle of the city and give the music-creation process music time it deserved. At the start, Árni took on his own spiritual and solitary journey. The first song he recorded in those outlawing days was “Exile”, to underline his feeling of this new lonesome experience of working. An endless supply of new song ideas came constantly from Natasha and the EP started to take shape. They asked a fellow musician from the powerful Gudjonsson family to mix the tracks. Arnar Gudjonsson took on the task gladly, who is notable for his work with bands like Leaves, Kaleo, and Warmland. Last year the band started off on the small stages of Reykjavik, and practiced their show in Mexico, which provided some good vibes for the kind locals. When not recording music as Pale Moon, they run the concept store Kvartyra 49 in Reykjavik. Hello! What is the main concept behind your first EP? Do the songs’ sonics match the mood/feeling of the lyrics or are they contrasting with each other? Why did you decide to release an EP instead of an album?